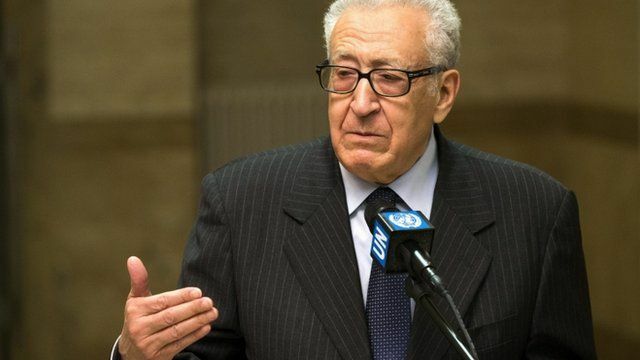 Peace envoy: 'Syria's Assad should go' Jump to media player Leaked comments from a UN security council briefing reveal peace envoy Lakhdar Brahimi suggested President Assad must step down as part of any political transition. Brahimi: 'UN must act on Syria' Jump to media player Syria is being destroyed "bit by bit" with grave consequences for the wider region, peace envoy Lakhdar Brahimi has warned. Talks scheduled for Saturday aimed at trying to end the civil war in Syria will see international powers meet with the opposition to discuss a political transition. Ahead of the meeting, in leaked comments from a UN security council briefing, peace envoy Lakhdar Brahimi suggested President Assad must step down as part of the transition. The comments were part of a six-point plan laid out by the envoy as he prepares to join the US vice-president in Munich for the meetings with Ahmed Moaz al-Khatib, President of the Syrian National Coalition. Russia has denied reports that Foreign Minister Sergei Lavrov will attend the talks. The BBC's Lyse Doucet said Mr Brahimi had previously alluded to the idea of Assad stepping down.